Join Amy Youngblood Interiors for this year's Tour of Kitchens on Saturday, November 7 - a day filled with the best design, food, and entertaining the queen city has to offer. 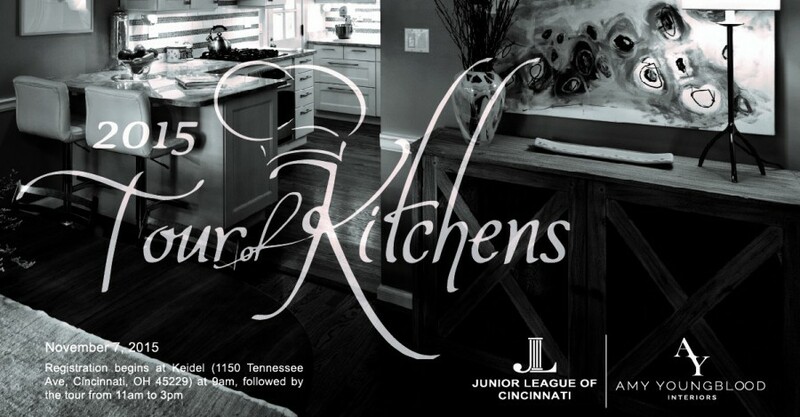 Sponsored by the Junior League of Cincinnati, the self-guided tour through several beautifully-designed kitchens in Indian Hill and the surrounding area begins at 11 AM at Keidel (1150 Tennessee Ave. Cincinnati, Ohio, 45229) and continues until 3 PM. *Registration begins at 9:30 AM. Tasty snacks and treats by Cincinnati's top chefs and caterers will be provided at the different locations, along with the chance to meet and mingle with the talent behind the designs! Amy Youngblood Interiors partners with the Junior League as a "Gold Level" sponsor this year. Our work will be featured on a 55" monitor at the check-in area at the beautiful, trend setting showroom of Keidel. Our Team will also be on hand to answer any design questions and discuss your potential home project. Purchase tickets (which includes 50% off Cincinnati Seasoned cookbooks) and find out more info from the Junior League's website. Proceeds benefit a variety of significant community causes organized by the JLC. We look forward to seeing you there! Please feel free to contact us with questions.